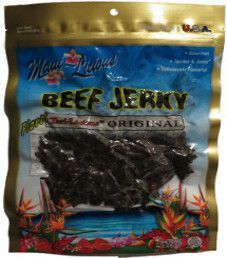 Maui~Licious is distributed by Maui~Licious, Inc., and located in San Juan Capistrano, California. The company was founded in 2000. 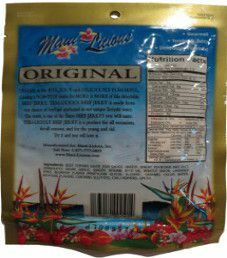 Maui~Licious, Inc. was contacted by a jerky maker seeking to purchase a 5 gallon bucket of their trademark Teri-Licious sauce created 75 years ago. Instead Dr. Chuck started making his own jerky using this Teri-Licious sauce as the marinade. It appears that the only liquid used in the marinade is soy sauce and sesame seed oil. Sesame is a healthy food, but some people have a sesame allergen. It is good to see some super healthy vegetables used. We have minced onion, garlic and ginger. 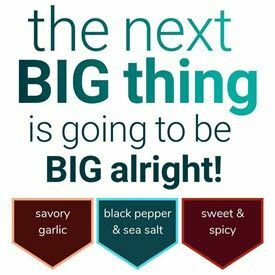 Black pepper is great both taste and health wise. The most interesting ingredient is lavender spice. The scent of lavender, a flower, is said to be soothing to the human spirit, and has been used as a culinary herb for centuries. No other spice smells like lavender, and it has multiple health benefits. Easily the worst ingredient is the bourbon flavor. Bourbon is one of the more expensive alcohols out there, where it would be much cheaper to use some sort of unhealthy, artificial flavor. Using artificial flavors is terrible, and especially propylene glycol, which is a derivative of oil. The sugar level is extremely high at 13 grams of sugar per 28 grams of jerky. Our preference is 3 grams of sugar or less. The salt level is somewhat high at 350mg of salt per 28 grams of jerky. 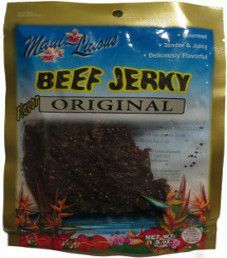 This jerky contains no MSG, and no sodium nitrite. Apart from the pretty much mandatory salt, there are no unhealthy preservatives used in this jerky. All the strips are mostly small in size, cut with just barely a medium thickness. The texture is soft and tender, and as a result, easy to chew. In part, that has to be credited with this bag being vacuum sealed, a major plus. 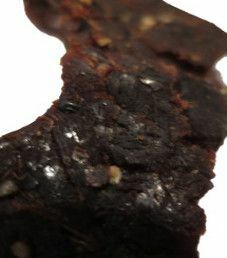 There are no visible signs of fat on this jerky, and there is a slight residue left on your fingers after handling this jerky. The bag does exude a strong odor that might be construed as bourbon, but smells more like red wine. There is a fair amount of sweetness in this jerky. The salt is not strong tasting. This jerky does manage to capture some of that classic teriyaki taste. The soy taste is light, as is the sesame taste. Really it’s a complex, distinctive taste. Perhaps from the lavender spice, which is derived from a flower. Hopefully not from the oil derivative propylene glycol. You can purchase this 3.65 ounce/103 gram bag for $7.99, which works out to $2.18 an ounce. That would rate as an average price. 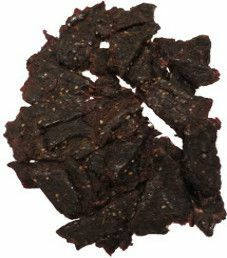 This jerky is worth your money, and promises not to be boring, plus easy chewing, having a soft and tender texture. This bag certainly has some color. No labels on this bag, everything is imprinted directly on the bag. There are colorful plants and flowers, with a body of water in the background, presumably the ocean. Above the water, the sky in the background gradually gets bluer the higher it gets, quite clever. Slogans printed on the bag are “Gourmet”, “Tender & Juicy” and “Deliciously Flavorful”. The Teri-Licious™ trademark name is printed on both the front and back. Almost all bag categories are covered. Missing are allergen alerts, and the jerky weight is not stated in grams. As stated earlier, this 3.65 ounce/103 gram bag was admirably vacuum sealed. 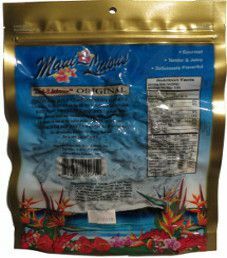 There is a nice blurb about Maui~Licious printed on the bag. To the credit of Maui~Licious, they provide a toll free number for any customer inquiries. The bag at the bottom is a 1.8 ounce/51 gram bag of this original flavor that retails for $4.99, also kindly submitted by Dr. Chuck.